The bowerbird collects shiny things, and layers them all around its nest. I get that. You could even say it was my spirit animal for a while there. I am actually picturing a beautiful, glittery, feathery, sparkly nest right now and thinking how lovely it sounds. Wait, I feel like I am heading in the wrong direction. Minimalism. That’s where we are going today. Step away from the shiny. Anyway, it got so bad that I would wake up in the middle of the night, thinking about how I should move a side table across the room. And maybe pop a painting up above it. And possibly redo the whole colour scheme. It was an obsession. But it was not filling the gaps. It was desperately chasing the high of change, of something new. Like maybe if life looked different, it would feel different. Unfortunately, this search for fulfilment through retail therapy is just the kind of thing kids absorb. So Madelyn started suggesting hitting the shops as a great way to spend a rainy day. Or any day. In retrospect, we weren’t so much attached to having stuff, as much as getting it. That shiny, new hope – that THIS lovely wooden frame, THAT perfect throw cushion – or sparkly fairy wings, if you’re four – would be the final piece of the puzzle in your search for happiness. Of course, it never worked. And even worse, once we had this urgently needed new addition, it just added to the clutter already crammed into our house, which made me more stressed and overwhelmed, and took more time to tidy up. It started to feel like I was either cleaning the house whenever I was at home, or feeling guilty that I wasn’t cleaning the house. And whichever it was, it was always a mess anyway. It took a while for me to realise what we were doing, and how fruitless it was. I started reading minimalist blogs, watching decluttering shows and following Marie Kondo and other advocates of letting go of material possessions. And they resonated. A lot. There was a lot of talk about being trapped by your possessions, and drowning under the weight of all the things you carry in your house, in your wallet, in your heart. I realised just how much the constant battle to tame our wild house increased my everyday anxiety and sent my mood spiralling. The answer started to look clear. Simplify. Downsize. Let go of all the things that did not deserve to be taking up space in my home and in my head. So I decided to undo our attachment to STUFF. 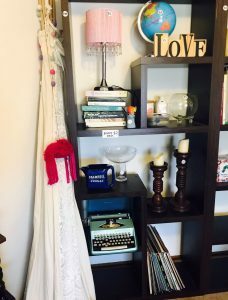 The first time I went on a decluttering spree, I got rid of a basket of things. A small basket. And actually BOUGHT some tubs and shelves to organise what I had left. Yes, you read that right. I bought more stuff, to organise the too much stuff I already had. The second time, I let go of a bit more. I noticed that while the moment of giving something away was still difficult, as soon as it was physically gone – nothing. That was a big turning point. If I donated a box of clothes, I would struggle to name three things in the box the next day. After that, it got much easier, because I realised the attachment I thought I felt wasn’t real, or was shallow, at best. On about the sixth round, the thought started blossoming that we should take things a bit further, and go off in search of new experiences as well. If we were dropping the focus on things, then surely we should replace it with experiences? Yes! I As I walked around the house trying to work out what should go into storage, I discovered there wasn’t really anything I wanted to keep so much, that I would leave it sitting indefinitely in a garage somewhere until we decided our next move. It was all just stuff. And it could all go. We put stickers on everything in the house, right where it was, then opened the doors for a mammoth garage sale. It was amazing. So many people asked about what we were doing, and the good feeling was so uplifting. We sold almost everything in one day, and donated the rest to a variety of places and people. I paid off my credit cards. It is probably the first time in my adult life I have been without debt. Our culture encourages us to have credit cards, to buy now, pay later. It all adds to our stress and worry. You don’t have to live like that if you don’t want to. It feels good. I put the rest into our travel fund. We are learning together that possessions are not the answer. What we need is experience and connection. That’s the good stuff. We are working on living more intentionally and mindfully, instead of just going along with the flow of consumerist society. It has only been a couple of weeks so far, but it already feels as though it has been transformative, even just as a mental shift. It feels lighter, more free and much more like we are on the right track. So this adventure we are on now is all about placing the value on experiences over things. 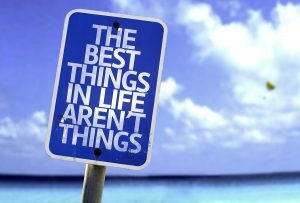 It is a good learning curve for us to live in the moment and appreciate what is happening every day. I can feel that I am less stressed and anxious, and have more patience. I can’t even explain in words how important this is when you spend all your time with a four year old. You know. Of course, there will probably be a time when we settle a little more, and need to find a middle ground on the whole minimalism thing. And that’s okay too. But the sudden realisation that materialism held such sway over us was a pretty big moment. Life changing, even.